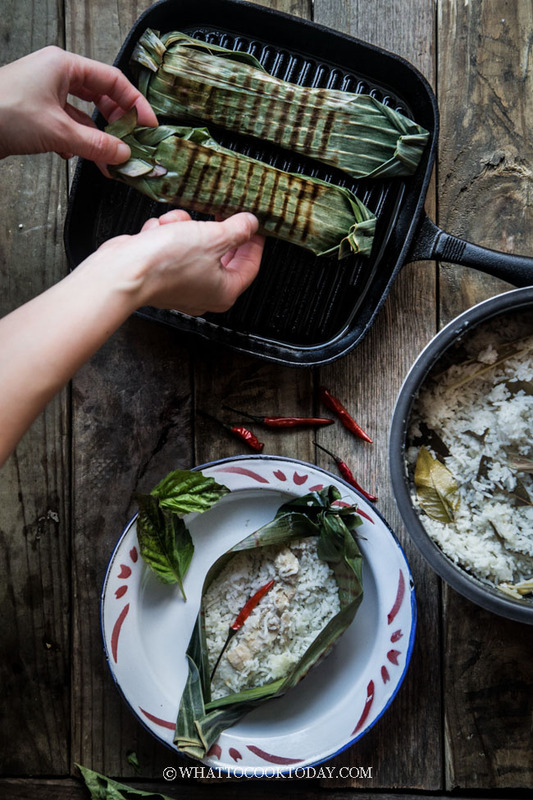 Coconut rice is cooked with aromatic herbs topped with chicken and basil and then wrapped with banana leaves and grilled to perfection. The prospect of doing outdoor activities this weekend is very promising! Can you believe that we are going to have a 50-60 F (about 12-15 Celcius) ? For three days in a row ? Here in Minnesota! In February! February is one of the coldest months for winter. Considering the -35 F windchill we had last month, this upcoming weather is definitely like a summer for us the Minnesotans! I’m telling you people are going to wear slippers and ditch their jackets (I’m talking about myself!). Sorry, I get a little carried away when I talk about weather during winter time! Not that I will run out there and grill up a storm (but again…can you blame me? 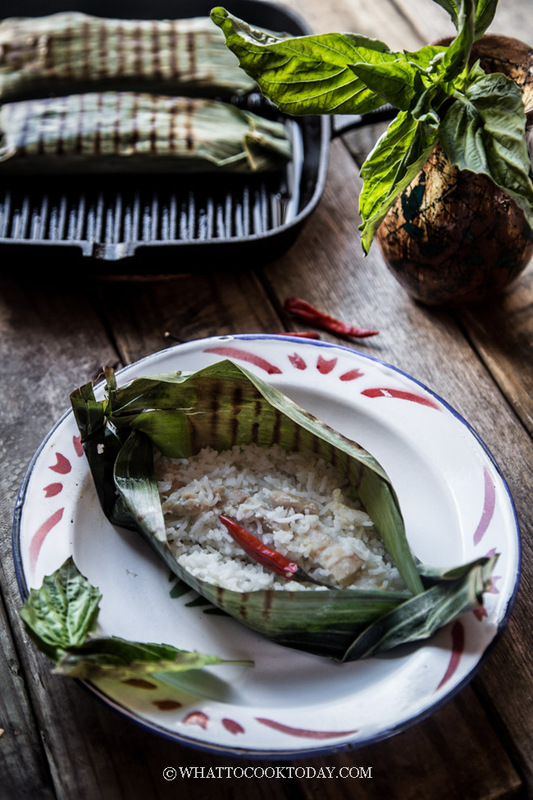 ), but few months ago I made this nasi bakar (nasi = rice, bakar = to burn/grill, but we are not burning anything!) and the photos were buried deep down in the archives. I’m running behind this whole blogging thing and I’m trying to get my act together at 10:30 pm. So, please excuse me if I type anything wrong or something doesn’t make sense to you! I usually will go back to read on my own post again after it’s up and try to catch any mistakes. 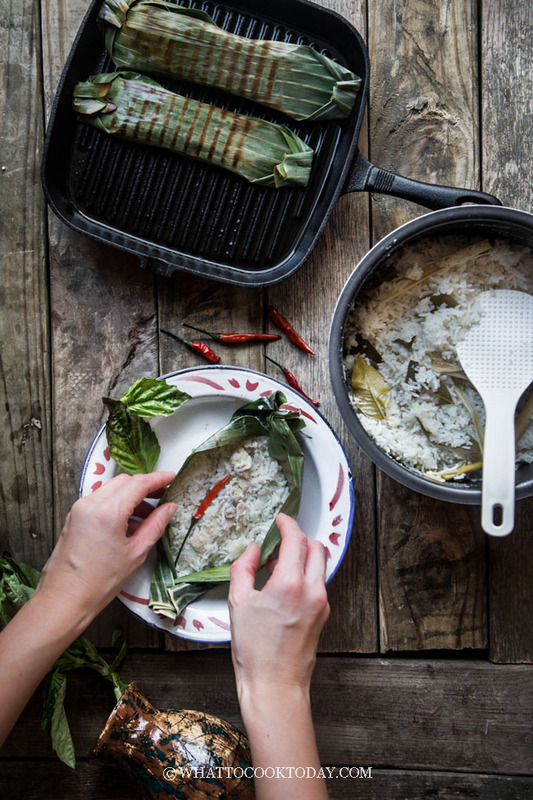 There are so many versions of nasi bakar out there and honestly, there aren’t really any right or wrong recipes if you ask me. That’s why I love cooking because it’s pretty flexible and forgiving. 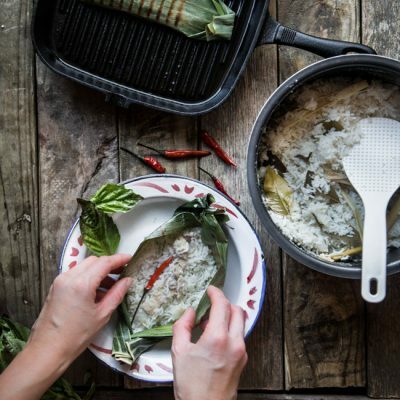 I cook my rice in coconut milk and aromatic herbs, packed in some chicken and fresh herb, wrapped them in banana leaves and grill them so that the banana leaves impart that amazing aroma to the rice. 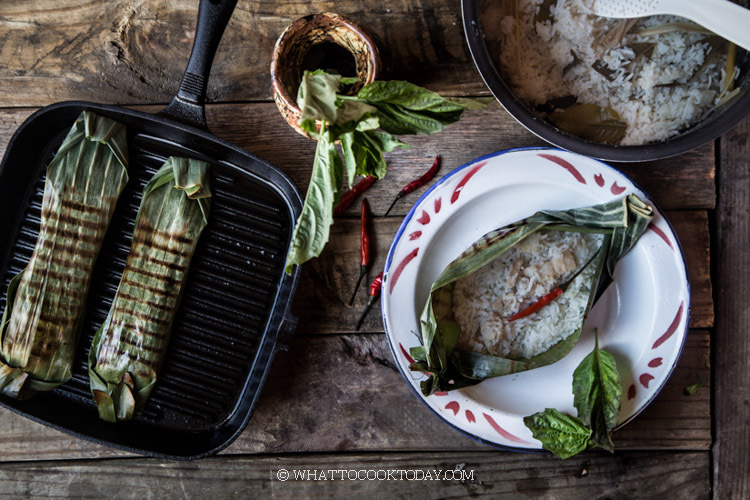 If you have never grilled with banana leaves before….oh well, truly you are missing out! The aroma is ever so wonderful! Even my 3 and 6 years old kiddos love this nasi bakar. My version of nasi bakar is more “pale” in color but it tasted amazing. The rice is so fragrant and I think my photos don’t do much justice to the actual thing! Some people put some turmeric to cook their rice and so the color is more vibrant. Really….add in whatever you want ! 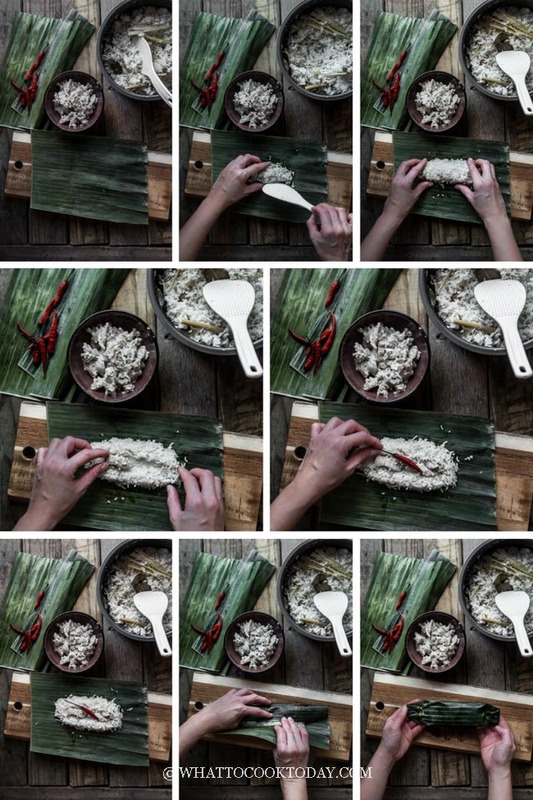 If you are wondering where to get banana leaves ? The frozen section at the Asian grocery store is where they are at! 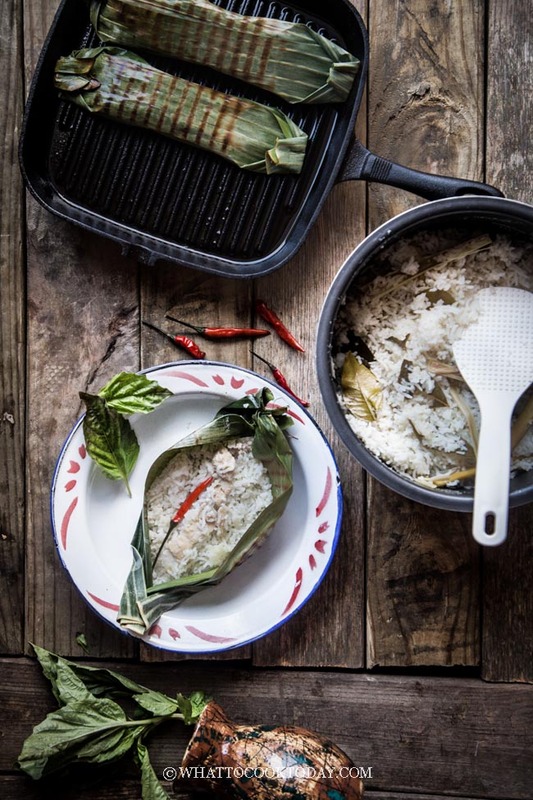 Check out other Southeast Asia Recipes you might be interested in.